I like idea of renovating the map, I had thought about it in the past, but I would have had to change too many things. 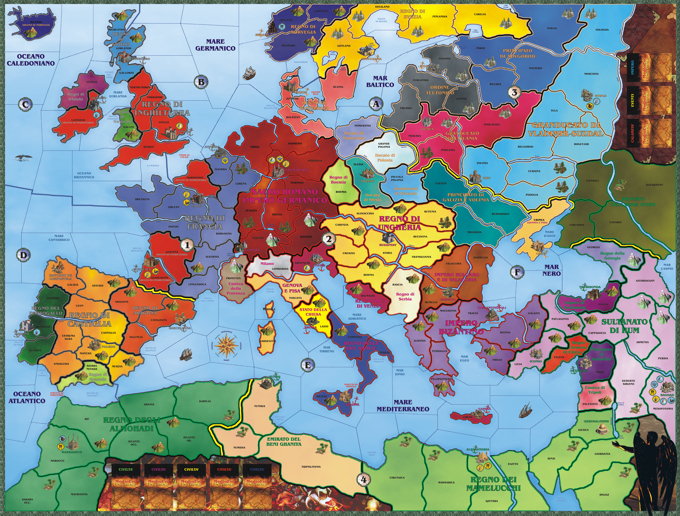 Now, as the next step is the production of the game, something final and definite is necessary…as the map has to be changed and made “more historical”, it’s worth changing the graphics too. For the historical part (borders, Kingdoms and so on) I have been advised to consult the State archive in Milan…I will go sooner or later, when I have a free day! 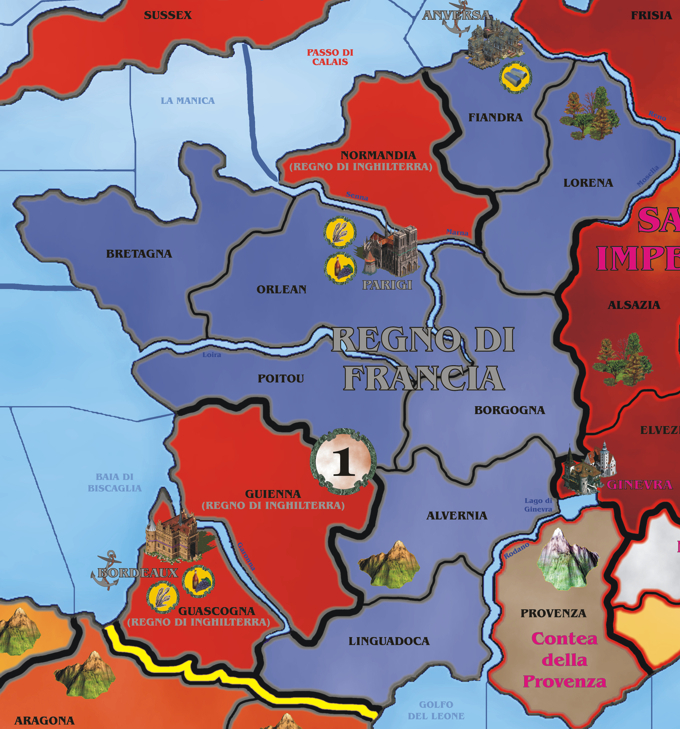 - Brittany and Normandy have to be together, otherwise they would be too small for the game; also the 8 players would have to have all 8 starting territories to be balanced…in the 1999 map the territories were slightly smaller because I was using RisiKo tanks and the “empires” were made of 10 territories. 1) putting The Pale in Ireland near Dublin or separating the south of England in 2 territories. 2) dividing Ireland in 2 parts, 1 under the Normans and 1 under the Gaelics, without considering the English. 3) putting Normans, Gaelics and English. In the end I enlarged “The Pale” and put the rest under the Gaelics, excluding the Normans (they were starting to lose power in that period)…maybe the 3rd solution is the best, if I make Ireland bigger they all fit in. It this link is the situation in Ireland, in a period that disadvantaged the English and the Normans, who were under the Gaelic population outside “The Pale”. In 1260 the Norman invasion had reached the peak of 1254 and was starting to withdraw. So the situation should be more or less like this, with only Munster and Ulster as provinces. We can’t separate Normans from English yet, as the Tudor conquest won’t be until the XVI century. To give you some advice on Ireland I need to know some things about the game. Can each faction be chosen by the player, or are some provinces neutral and can’t be chosen? Sorry, but in the black and white version of the map I hadn’t seen the Kingdom of Bohemia. 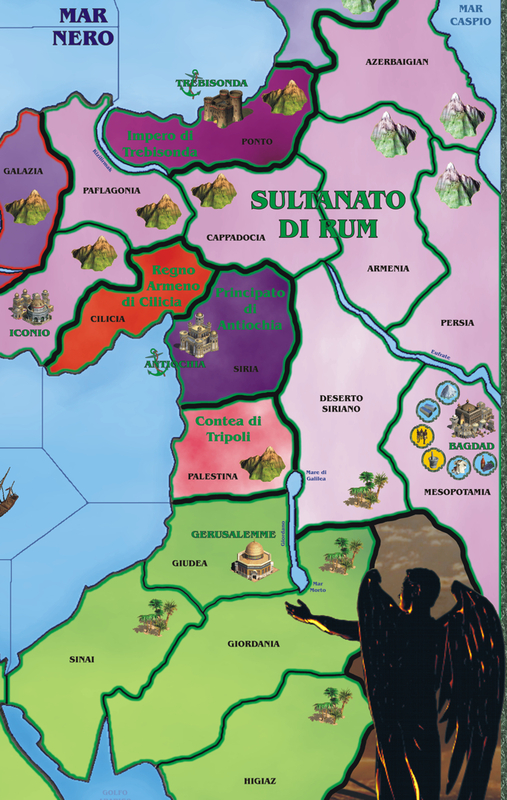 As for the map, I don’t know if you know the boardgame “L’era di Conan”, but the map has different colours for the different regions, in various shades so that you can still read the drawings on the map. Could this be a compromise? So only the bigger kingdoms can be chosen, a player can’t for example choose the county of Provence as a faction, right? Are there difficulties in choosing a smaller Kingdom? P.S. Now I’ll look for some books to suggest. I used the “Vitolo” as a book on medieval history, but it’s not the best. The Montanari is easier, but it doesn’t explain everything in detail. If you are interested in the war aspect there’s not much in Italian, there is “War in the Middle Ages” (Contamine), “Robberies, sieges and battles” (Settia), “Special expeditions during the cavalry period” (I can’t remember the author). If you need anything specific tell me. 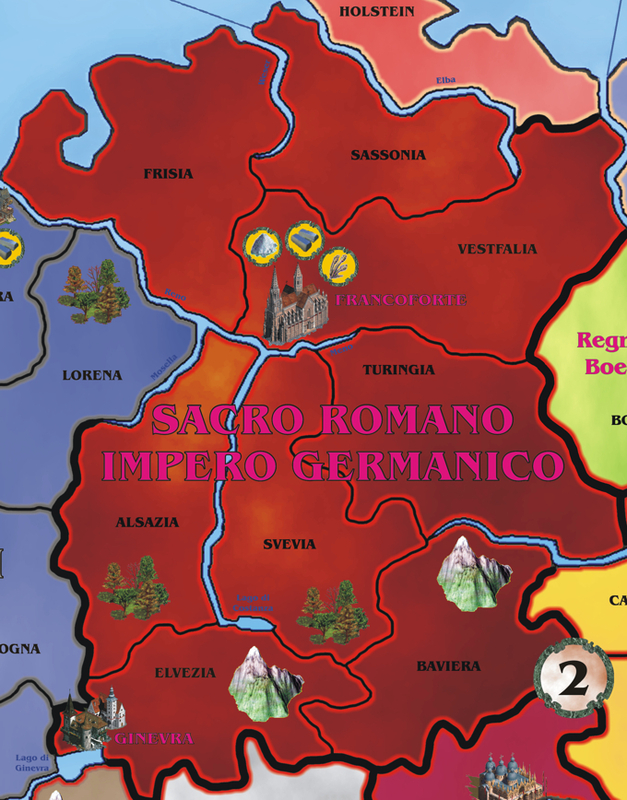 Only the bigger Kingdoms with 8 territories (10 Kingdoms in total) can be chosen by the players at the beginning of the game, the other territories must be conquered in battle against the local population or against other players who had already conquered them. If the Vitolo isn’t the best so you suggest the Montanari? I don’t really know if I want to read a book in English…I will think about the other you told me about. Do you know a serious book on the cavalry religious orders? The numbers represent the land areas the map is divided in, the letters represent the sea areas…they are used to determinate which areas are hit by random events or misfortunes. Here you can see the 4 land areas better, and they can be changed if necessary…my idea was to make them coincide with the number of players: area 1-2 for 3-5 players, area 3 for 6-8 players, area 4 for 9-10 players. The bold yellow lines are to separate the playing areas when there are few players. Size of the map? Now 1360x1040mm, but I might have to change it if I want to produce a basic version for 3-5 or 3-6 players+ 1-2 expansions, and consider some standard formats, maybe a bit bigger or smaller. I will ask another forum for standard sizes of the panels. Can the “Barbaric” Kingdoms be allied? Because then we could simulate the Irish situation, when a player attacks Munster or Ulster they can defend themselves together. They don’t support each other when attacking because they don’t want the other to get too powerful. Question, we could print a small shield with the coat of arms of the neutral/barbaric kingdoms on the map. To make them recognizable but not as bold as different colours. You could do 2 provinces which won’t be easy to conquer for the English. OT: the Montanari for a general idea is more than enough. I read “Teutonic Cavaliers” (Bogdan) and “the Templers” (Barber) for information on monastic/cavalry orders, they tell the individual stories, without too many details. I didn’t read anything on the ospitalieri. If I find anything more interesting I will post it to you. Anyway, I don’t think this system is difficult, they would be powerful when defending, but a lot less when attacking ^^. I would cut Ireland like on the 1300 map I sent you. So…the barbaric Kingdoms can be allied? We tried the idea out in a couple of games…the tests were on the main Kingdoms: if there are 4 players, we will use a map area for 3-5 players, so the 5th player’s kingdom would be occupied by the barbarians. We also tried considering the barbarians as a single population, which made things very interesting from a strategic point of view, as it made the conquest of the bigger Kingdoms more difficult. To make things easier visually we tried exchanging the barbarians’ and the Kingdom’s pawns, as if there was a player, following the barbaric rules. We could make them more powerful: if the Kingdom of Hungary was barbaric, when we attack Croatia it would be like attacking the whole Kingdom, so we could create 2-3 rules to allow the Hungarian army to defend the Kingdom, re conquer Croatia and counterattack. “Allied” barbarians is a more realistic solution, but I would keep it as an advanced or optional rule…same thing with the trade %, it would slow the game down too much. 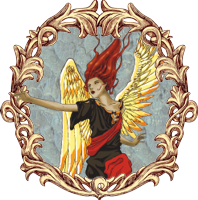 I will update the “Heraldic” section of this forum when I finish the discussion on dragonslair. You mean I should put a central territory under the Normans and other 2 (1 north and 1 south) controlled by the Irish? And I’ll consider the Irish 2 separate Kingdoms or only one? What do I call the 3 territories? Munster, Ui Neill, but the third one? 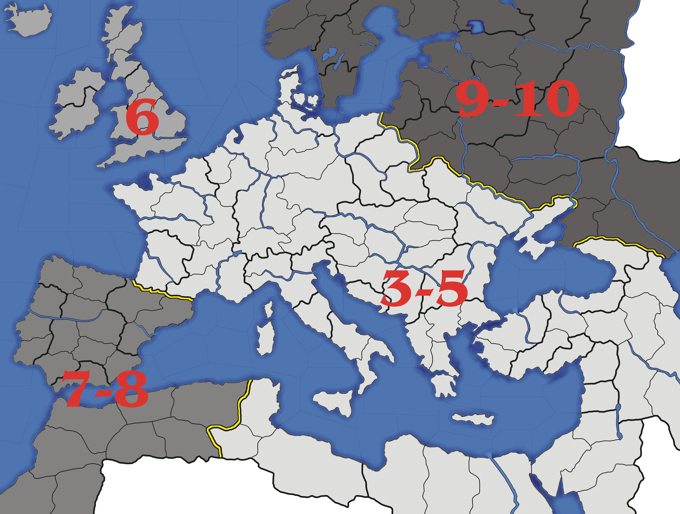 So, what should I do: 2, 3 or 4 territories? And which ones? Option 1: 4territories: - Barbarians: Munster, Ui Neil (Ulster), -Normans/English: Connacht (between Sligo, Shannon and Athelone), Pale and Leister. Option 2: 3territories: -Barbarians: Munster, Ui Neil (Ulster), -Normans/English: dominion of Ireland, which includes the 2 provinces. The first option is more historical, the second is probably easier to play. Ps. English and Normans in this period are the same thing. The distinction will be in 1500. 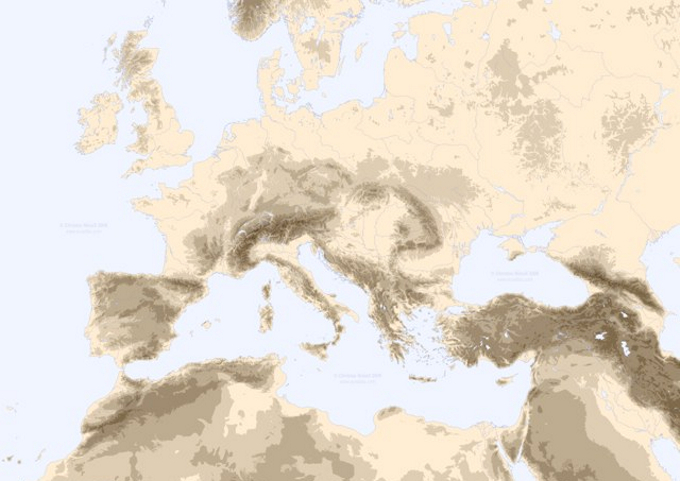 Ok, let’s do option 2: 3 territories –Barbarians: Munster and Ulster; Normans: central Ireland. Let’s consider the Selgiuchidi Turks and the Byzantines…my map is set straight after the conquest of Constantinople of the Nicaea Empire in 1261 (Michael VIII). 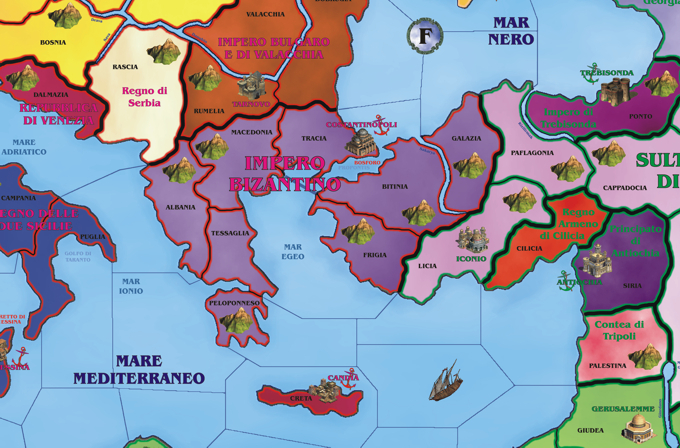 Venice: I considered the territories of Ragusa important, so I made them bigger (I think I read somewhere that Ragusa had made some paper walls so as to seem more powerful and discourage enemies). 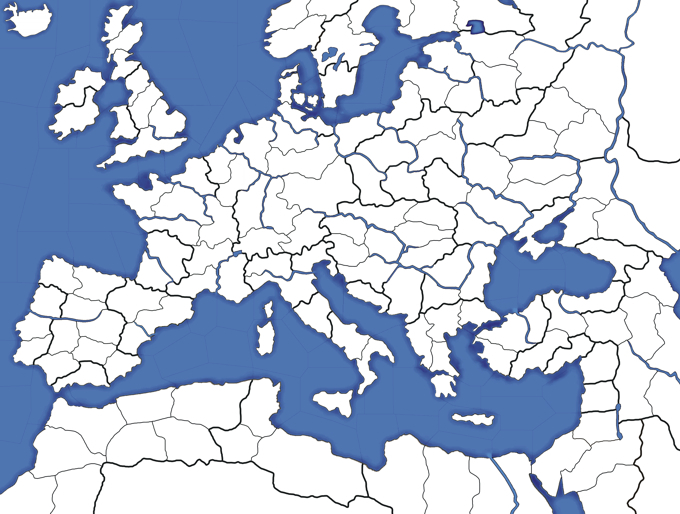 Crete was under Venice, I canceled the Aegean isles because they aren’t important. 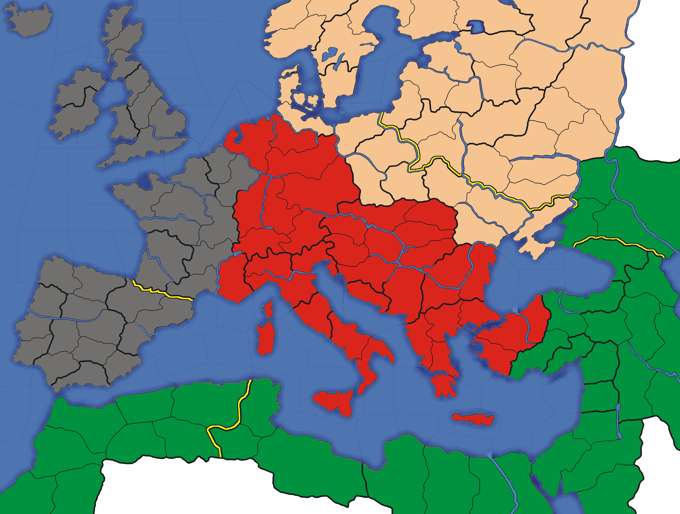 Bulgaria and Walachia: shall I separate them? 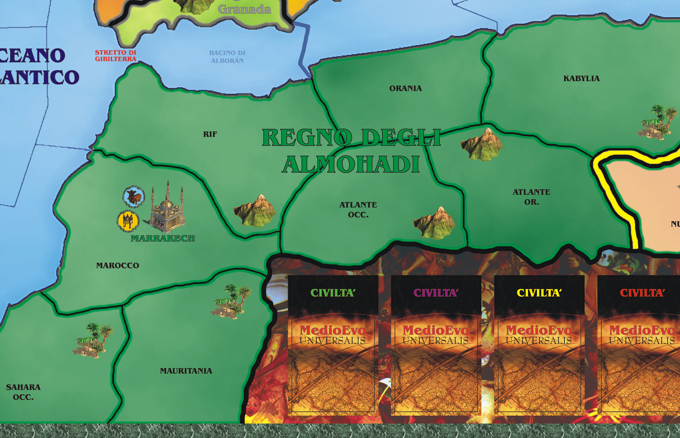 Principality of Antioch: it was a lot smaller, but it still existed so I made it bigger. County of Tripoli: it was a lot smaller, but it still existed so I made it bigger. Selgiuchidi Turks: west territories ok…in the east the Mongols were advancing (Khanate): Baghdad had been conquered in 1258…so Persia was already under the Mongols? Principality of Achaia: it resists till 1432 when Zachariah dies and then it passes under the Byzantine Empire…but I think it is too small, I wouldn’t consider it. Duchy of Athens: I think it is too small. Thessalonica: it was conquered by the Latins in 1234 so it has already disappeared. Epirus: this occupies the area I indicated as Albania and it will last till 1315…it’s big enough, so should it be put in? - Selgiuchidi Turks don’t have Baghdad (it’s been conquered by the Mongols). 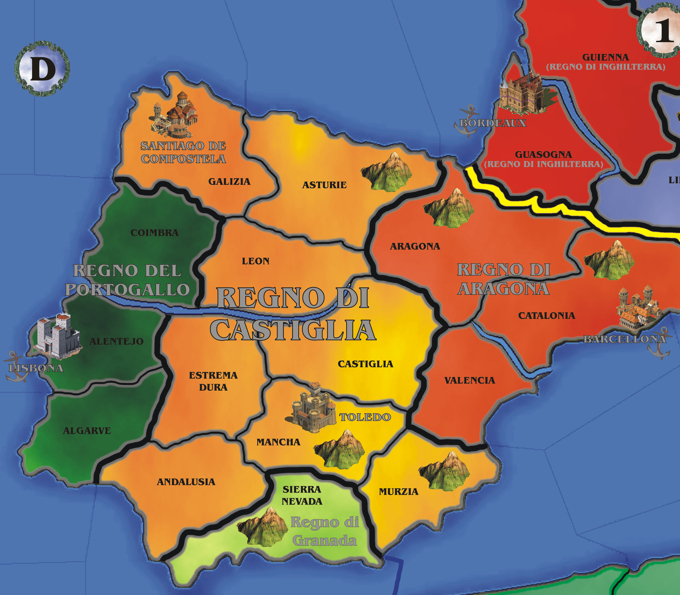 - Kingdom of Castile, it shouldn’t be difficult to take a territory away: Fondo Mancha and Castile or Andalusia and Estremadura or Mancha and Estremadura? - same thing for the Almohads, I would unite East and West Atlas. 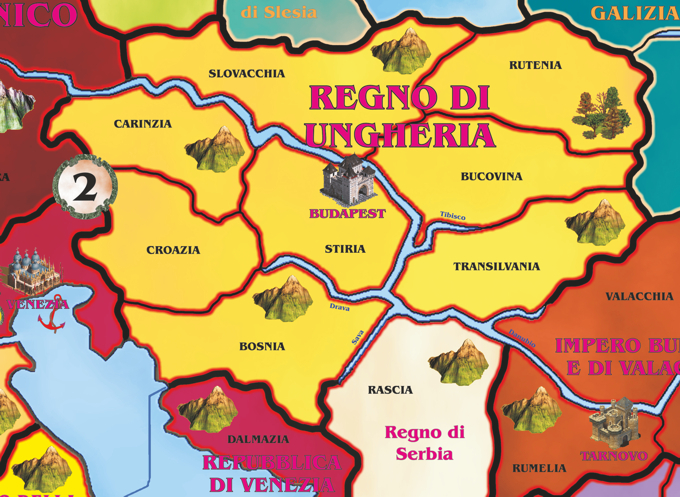 - same thing for the Hungarians: I would unite Bucovina and Ruthenia, what do you think? - what about the French? Shall I unite Flanders and Lorain? - in the Sacred Germanic Roman Empire? Swabia united with Thuringia?